Agtugop Cold Spring is a natural refreshing water coming out from the mountainside of Asturias, Cebu, the Philippines. Asturias Municipality is a sleepy part of Cebu Province’s northwestern area. The area boasts its fecund natural beauty and resources including cold springs. It is about 2.5 hours away from Cebu City, the provinces’ capital. Agtugop Cold Spring is one of your refuges to go during the blistering heat of summer time. Certainly, you can pay a visit to the public ‘resort’ anytime of the year. Nothing is so rejuvenating compared to immersing yourself into a pool of natural cold spring water in Asturias. It would be more enjoyable if you visit Agtugop Cold spring with a group going out as a day’s picnic. Ensure that you bring with you provisions as stores are not available nearby. Asturias Municipality is north of Balamban Municipality and west of Danao City. It means that while you are by the mountains you can also experience the panoramic views of the sea. The calm and mesmerizing serene blue sea and surrounding. Yes, you don’t need to worry about spending your income as coming to the spring does not really cost you much damage! You only need to pay for your transport fare vice versa basis. Entrance fee? It’s FREE! Yes, it is. That’s because nobody (yet) claims and operates to make it a resort or something. So, visit the place while it’s still not controlled by some astute business people! *Take a Bus or Van. It is 120 Pesos per head for V-Hire, 100 Pesos per head for Bus. Double those figures for return fares. *Motorcycle fare is around 40 Pesos per head one way. Double that for return fare. Corkage Fee? No, there is no such thing as nobody is managing the spring that collects any payment when you bring your provisions. So, go ahead and bring lechons and all to the spring! 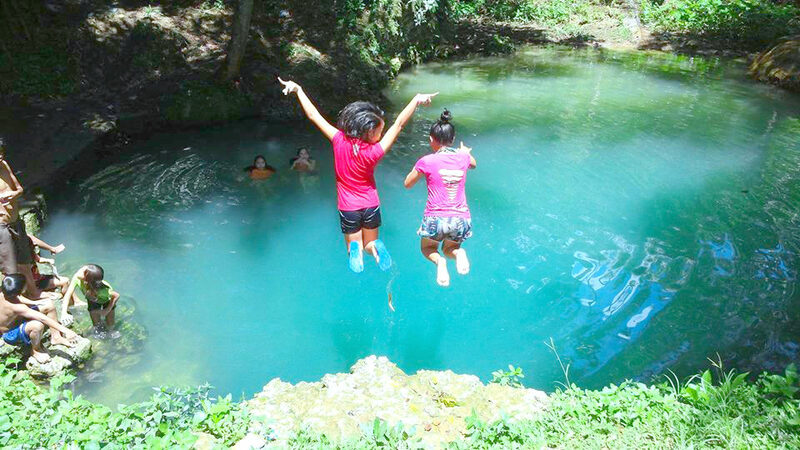 The cold spring is located in Barangay Agtugop, Asturias, Northwestern Cebu. You have two access routes to the area which we will recommend that you take. From Ayala Center Cebu (a humongus shopping mall in Cebu City) to Tuburan (a municipality), take a V-Hire vehicle. Make sure that you get off (please tell the driver ahead) at Barangagy Bago Bridge area. It is a newly-built bridge in the area. About 120 pesos per head one-way ticket! From the bridge hire a motorcycle service to ferry you to Barangay Agtugop of Asturias. Pay 40 pesos per passenger (note that the fare may increase so bring in extra). Upon arrival in the area, simply ask any local for your destination. This route is through Transcentral Highway via Busay and Balamban Municipality. Of course, if you have your own vehicle (or renting a van), you can navigate your way. All possible navigation application will prove useful if you don’t have any idea (or guide) about the place. Apps like Waze or Google Maps are useful enough to get to the cold and gushing springs of Barangay Agtugop. From Cebu South Bus Terminal in Cebu City, you can take a bus going to Toledo/Tuburan. The fare is around 100 pesos. Approximately, it takes from 3 to 4 hours to get there. Same as the Van service, you have to inform the driver to drop you off at Barangay Bago Bridge area. If you are departing Minglanilla, Naga, or Toledo City, the fare is around 120 Pesos. Again, from the bridge of Barangay Bago, take a motorcycle for a fare of 40 pesos. Hope this is useful in your search. When you do travel there, wishing you an exciting adventure and safe return.